Currently, Karen works out of her own private studio, a change she decided to make when she learned she was pregnant with her daughter—it made her want the privacy, flexibility, and autonomy that a space of her own would offer. She shares the space with one other artist. “I think I’d have a hard time going back to a shop, at least until my daughter is in school, because being a mother and a tattoo artist is very different thing than just being a tattoo artist on its own,” she tells me. 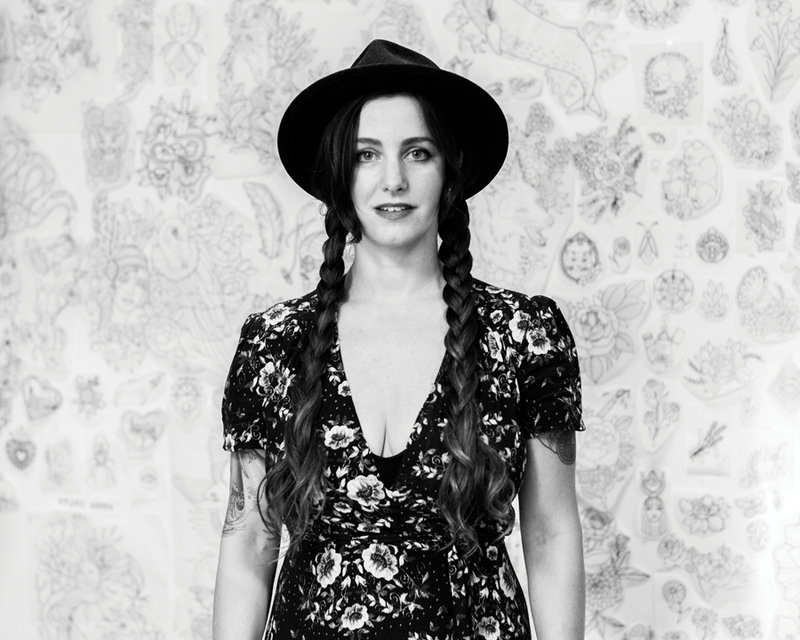 Her own style starts with traditional Americana and moves into a more illustrative direction, something she describes as an almost feminine take on the traditional American tattoo art. Specifically, she focuses on images from nature, like flowers, plants, and birds. “I believe images from nature can flatter the body perfectly, so working with organic content and designing it to flow with any particular placement is one of my favorite things about the art form.” she tells me. Karen Glass is an incredible artist -- tattoos, performance, and music are where her talents shine. Her work is as magical as she is, filled with vivid color and gorgeous black and gray shading, and placed in spots that truly complement the human body. The self-professed country girl at heart has called Brooklyn home since 2000. She's married to a native Brooklynite Zach (owner of the Bushwick bar Our Wicked Lady), and they have a 1-year-old daughter, Bianca, and a 10-year-old dog named Trolley. Karen and Zach also play in the indie band Bugs in the Dark. Karen tattoos in a private studio in Williamsburg, and as you can see, her work is enchanting. Check out what she had to say below. I got tattooed by a good friend and fell in love with the process. I was drawn to the artistic design, the technical aspect, and the intimate human connection. My friend owned a Brooklyn tattoo shop and eventually decided to teach me. I managed the shop during my apprenticeship. It was an invaluable combination because I learned about running a small business while learning to tattoo. Watching how the different artists at the shop worked gave me insight into how I wanted to approach my career. What was the first tattoo that you got? Oh boy. I got my first tattoo when I was 14 and it was done by a scratcher in a dirty squat house in central Pennsylvania. It was a horribly executed image of Goofy on my foot. Luckily it was small and I had it covered up when I turned 18. Share a good story about a tattoo that you have done. Most tattoos sessions are an emotional experience for me. There is an energy exchange between the tattooer and client, and I have always been affected by it. I am an empath, and I have learned to protect myself from taking on negative energy by creating a positive exchange. Even the trauma from pain during a tattoo can be passed on, so I think of tattooing as energy work. I can tattoo while giving positive energy and turn it into a healing experience. I recently tattooed a woman who has a daughter the same age as mine. We talked about how becoming a mother drastically changes your view of yourself. Having a small child can make you feel like your body is no longer your own. She decided to get her tattoo on her sternum to reclaim a part of herself. The rose was an adornment that made her feel beautiful. As a breastfeeding mother I understood her feelings at a deep level. Doing this for her was healing for me. Have you ever tattooed yourself? The first tattoo I ever did was on myself as part of my apprenticeship. My mentor insisted that I shouldn't tattoo anyone else until I was ready to wear one of my own tattoos. I did a blossom on my thigh and I still love it. Tattooing myself, however, was awful! It's way more fun to have an artist you love tattoo you while you chat and connect with them. Who and what influences you in work/life? I'm inspired by so many people -- other tattooers, musicians, friends. I am constantly finding photos that spark new ideas -- that's my favorite thing about Instagram. It's endless inspiration to keep growing as an artist. I've always gotten a lot of my creative ideas from dreams. I have a vivid dream life and I try and capture some of that powerful imagery in my songs and drawings. 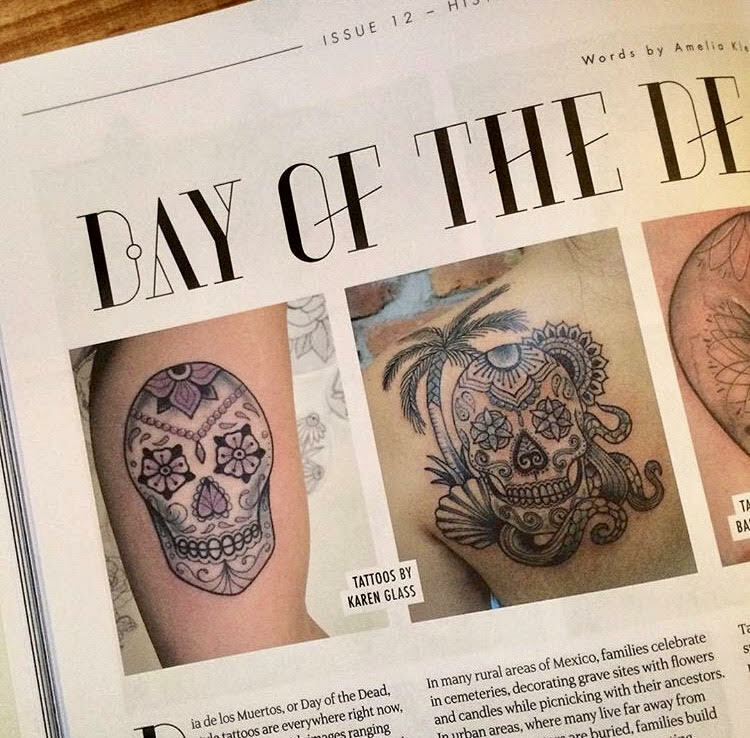 Photo feature in Things and Ink Magazine for Day Of The Dead skulls.